Snapchat first introduced these curated stories offering its users a way to document their daily routines, adventures, events, or just share a humorous picture with their followers. In 2016 Instagram introduced their version of stories, which is virtually the same feature but without the animated filters and an added live recording option. Now, Facebook has done all the above by creating their curated stories feature with options of animation, live recording, filters and drawing. 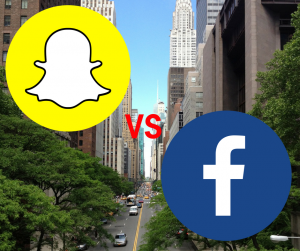 While Instagram might be looking to diversify their app, Facebook is not looking to copy Snapchat to improve their platform but, rather destroy Snapchat. This isn’t the first time Facebook has looked to put a stop to their competitor known as Snapchat. They’ve tried acquiring the company, buying a Chinese company that makes snapchat-style apps, making snapchat app knock-offs, and building a new in-app camera for Facebook Messenger. 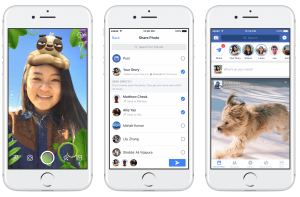 Now, Facebook has integrated stories with filters, animation and AR tech into its main app and on Facebook Messenger. The idea of copying Snapchat is not new and Facebook and Instagram are not the only ones doing it. WhatsApp began testing their own version of stories back in November of 2016. Today, the “Stories” feature is no longer unique to Snapchat and with Facebook owning millions of users that have never used Snapchat before, it looks like the concept of stories will become much more common knowledge. This is not a bad thing if your company already markets via Snapchat stories because now your company can extend that same content to multiple platforms. This also creates an opportunity to test and analyze the effectiveness of marketing through stories on these apps. Facebook, in a way, is now also offering an A|B testing situation for companies that want to know if Facebook Stories or Messenger Stories work better for their brand. This is an exciting time and there’s no need to worry about something like saturation. Will these other apps having the same feature devalue Snapchat and possibly destroy it, finally accomplishing what Facebook has attempted to do time and time again? Only time will tell but if it does destroy Snapchat it will not be as soon as Facebook would like. Snapchat users are pretty faithful to the app and at the end of the day one can think of the apps like soda. I think it’s safe to say that Snapchat is the coca-cola while Facebook is shaping up to be the Pepsi. Just because there are multiple colas out there that are virtually the same doesn’t mean consumers will lose all interest in colas or that one will stay and the others go out of business. That’s not to say that the market share for this app feature won’t begin to divide. Instagram has already slowed Snapchat’s growth by 82%. This helps to better segment the market as certain demographics will lean towards Snapchat while others will take up Facebook stories. From a marketing standpoint we will learn more about the consumers using these apps based on user preference. It’ll be a while before audiences that weren’t drawn to Snapchat originally come around to the idea of Facebook Stories, until then they are being turned into Ghosts to encourage them to start using the feature. For right now, there is one thing that’s certain, it’s a good idea to get on Facebook stories if you’re already advertising on Snapchat. In the end you might find one works better for your company than the other. Until then, test and analyze! If you want help with your online campaigns, contact Anvil, and we’ll get back to you with any questions you might have.